As Priyanka Chopra's maiden Hollywood debut is all set to hit the theatres on Friday, Varun Dhawan has been all praises for the movie. While the actor has been lauding the movie, his praises hasn't been because of PeeCee but for her co-star Dwayne Johnson. 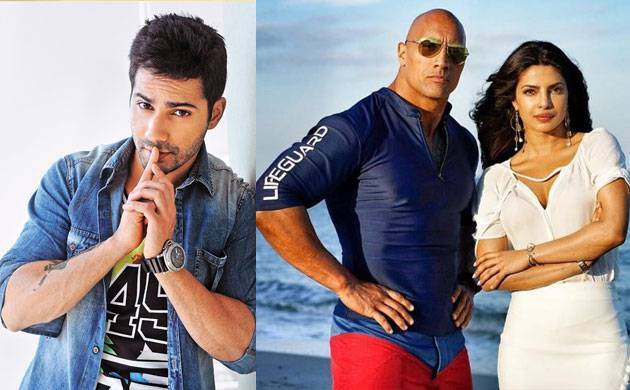 The 'Dishoom' actor to micro-blogging site Twitter to express his views about 'Baywatch' and sang praises for Dwaynes over his comic timing in movie. He also congratulated Priyanka Chopra for playing the baddie, Victoria Leeds, in style. "#Baywatch is fun in the sand. @TheRock brings the humour like only he can and @priyankachopra is bada**. I laughed throughout," wrote Varun. To this Johnson replied, "Thank you brotha! Me and @priyankachopra talked about how much you (and India) will enjoy the movie. Fun is the key word. #Baywatch." The "Badrinath Ki Dulhania" actor wrote back saying he is sure India will have a great time watching the film. Priyanka, who has made her Hollywood debut with the Seth Gordon-directed film, too replied to Varun saying she was excited for the movies release. "Thank you @Varun_dvn Im so glad u felt that way! Our fun mad action comedy releasing around the world #1dayforBaywatch @TheRock," wrote Priyanka. "Baywatch", which also features Zac Efron, Alexandra Daddario, Kelly Rohrbach and Jon Bass, is slated to release on June 2.